Scott Hall makes some final adjustments to the X3 ion thruster at the University of Michigan before a test. A thruster that's being developed for a future NASA mission to Mars broke several records during recent tests, suggesting that the technology is on track to take humans to the Red Planet within the next 20 years, project team members said. The X3 thruster, which was designed by researchers at the University of Michigan in cooperation with NASA and the U.S. Air Force, is a Hall thruster — a system that propels spacecraft by accelerating a stream of electrically charged atoms, known as ions. In the recent demonstration conducted at NASA's Glenn Research Center in Ohio, the X3 broke records for the maximum power output, thrust and operating current achieved by a Hall thruster to date, according to the research team at the University of Michigan and representatives from NASA. "We have shown that X3 can operate at over 100 kW of power," said Alec Gallimore, who is leading the project, in an interview with Space.com. "It operated at a huge range of power from 5 kW to 102 kW, with electrical current of up to 260 amperes. It generated 5.4 Newtons of thrust, which is the highest level of thrust achieved by any plasma thruster to date," added Gallimore, who is dean of engineering at the University of Michigan. The previous record was 3.3 Newtons, according to the school. Hall thrusters and other types of ion engines use electricity (usually generated by solar panels) to expel plasma — a gas-like cloud of charged particles — out a nozzle, thus generating thrust. This technique can propel spacecraft to much greater speeds than chemical propulsion rockets can, according to NASA. That's why researchers are so interested in ion propulsion's potential application for long-distance space travel. Whereas the maximum velocity that can be achieved by a chemical rocket is about 5 kilometers per second, a Hall thruster could get a craft up to 40 kilometers per second, Gallimore said. A head-on shot of the X3 ion thruster firing at 50 kilowatts, viewed through a warped mirror in the vacuum chamber. "You can think of electric propulsion as having 10 times the miles per gallon compared to chemical propulsion," Gallimore told Space.com. "Chemical propulsion systems can generate millions of kilowatts of power, while the existing electrical systems only achieve 3 to 4 kilowatts," Gallimore said. Commercially available Hall thrusters are not nearly powerful enough to propel a crewed Mars spacecraft, he added. "What we would need for human exploration is a system that can process something like 500,000 watts (500 kW), or even a million watts or more," Gallimore said. "That's something like 20, 30 or even 40 times the power of conventional electric propulsion systems." That's where the X3 comes in. Gallimore and his team are addressing the power problem by making the thruster bigger than these other systems and by developing a design that addresses one of the technology's shortcomings. "We figured out that instead of having one channel of plasma, where the plasma generated is exhausted from the thruster and produces thrust, we would have multiple channels in the same thruster," Gallimore said. "We call it a nested channel." According to Gallimore, using three channels allowed the engineers to make X3 much smaller and more compact than an equivalent single channel Hall thruster would have to be. 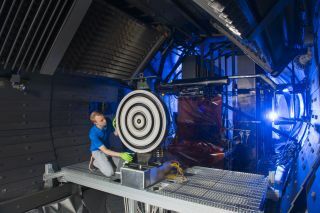 A side shot of the X3 ion thruster firing at 50 kilowatts. The University of Michigan team has been working on the technology in cooperation with the Air Force since 2009. First, the researchers developed a two-channel thruster, the X2, before moving on to the more powerful X3, which has three channels. In February 2016, the team partnered with California-based rocket-maker Aerojet Rocketdyne, which is developing a new electrical propulsion system, called XR-100, for NASA's Next Space Technologies for Exploration Partnerships, or NextSTEP program. The X3 thruster is a central part of the XR-100 system. Scott Hall, a Ph.D. student at the University of Michigan who has worked on the X3 project for the past five years, said the work has been rather challenging because of the thruster's size. "It's heavy — 500 pounds [227 kilograms]. It's almost a meter in diameter," Hall said. "Most Hall thrusters are the kind of thing that one or two people can pick up and carry around the lab. We need a crane to move X3 around." Next year, the team will run an even bigger test, which aims to prove that the thruster can operate at full power for 100 hours. Gallimore said the engineers are also designing a special magnetic shielding system that would keep the plasma away from the walls of the thruster to prevent damage and enable the thruster to operate reliably for even longer periods of time. Gallimore said that without the shielding a flight version X3 would probably start experiencing problems after several thousand hours of operations. A magnetically-shielded version could run for several years at full power, according to Gallimore.